+$How to get lightning fast downloads and seamless surfing for your home office or design studio. +$Fibre broadband isn't the rarity it once was. With coverage now available to over 90 per cent of UK premises, it's probably available at your home or studio. And super-fast fibre is no longer a luxury. 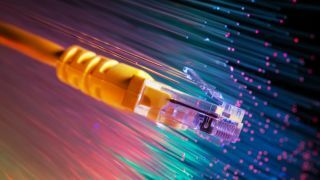 The prices of fibre broadband deals have fallen dramatically over the last few years and a speedier connection now only costs a few pounds more a month than slower ADSL. +$That's a small price to pay for the extra productivity that fibre broadband affords you. There are rapid downloads and uploads, stutter-free video calling and, of course, lightning quick internet browsing – all without the desk-thumping frustration caused by old-fashioned broadband connections. +$Our easy-to-work, up to the minute price comparison below will let you quickly see what the best fibre broadband deals in the UK today are. And below that we've answered some commonly asked questions about fibre, what speeds you really need and more. +$Do I need a fibre broadband deal? +$In the same way that you wouldn't scrimp on your laptop, camera equipment or视频编辑软件+$, it really pays dividends to invest in your internet connection as well. Bearing in mind that you're only looking at an extra fiver a month max, that's just an extra £60 to find each year for average broadband speeds of more than triple what you get with cheaper ADSL. +$So yes, if fibre是+$available where you are, then we'd heartily recommend you make the upgrade. +$Can I even get fibre broadband? +$As we said at the top of the page, fibre is now enormously common and is being rolled out to more places all the time. We've seen estimates that say fibre is now available to more than 95 per cent of UK premises. +$And it's really easy to see whether you're one of the majority that can get fibre. Simply enter your postcode where indicated immediately above the fibre broadband comparison above. If deals show in the table, then you're good to go. If all the tariffs suddenly disappear, then it looks like fibre isn't an option for you...sorry! +$What fibre broadband speed do I need? +$The range of speeds that you can get are enormous. They start at around 35Mb and can go all the way up to a faintly ridiculous 1Gb. +$An average speed of 35Mb is the equivalent download speed of just over 4MB per second. That should be absolutely fine if you're after home broadband and want to strike the balance between price and speed. +$If you're hunting for an internet plan for your small studio or 4K TV streaming is a must (either professionally or to help you unwind), then it's worth cranking up the speeds to 50Mb or over. Pretty much every provider out there can cater for these speeds. +$What about Virgin Media broadband deals? +$Virgin Media follows a very different model to most other ISPs. It doesn't faff around with slower ADSL connections and its entry-level package begins at around a rapid 50Mb, going all the way up to 350Mb (43MB per second). +$That may sound tempting – and Virgin is certainly very good value considering how fast it can be – but be warned that the availability of Virgin is much lower than the other internet companies. It's more like six in ten households that can get Virgin broadband. +$That's because it uses its own cable wiring instead of the standard Openreach fibre. That gives it greater control over speed and results in less bandwidth being used up by your neighbours. It also means however, that there are usually greater installation costs and you may be waiting longer to get started if you're in a rush. +$Can I get a 1Gb fibre broadband deal? +$Ultra-fast 1Gb broadband has only been rolled out to a very tiny proportion of the population as yet – only around 1 per cent. +$While the likes of BT and Vodafone have experimented with ultra-fast, other smaller providers have entered this space in the market, too. For example, less recognised companies such as+$Hyperoptic和+$Gigaclear+$have also begun rolling out 1Gb fibre. And often in more rural areas, too. +$So again, head on back up to the postcode entry box above the broadband price comparison at the top of the page and that will let you know within seconds whether any 1Gb fibre plans are available on your street of residence or work.